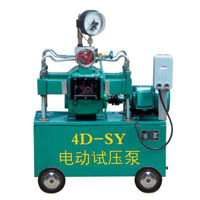 Model 4D-SY（6.3-80MPa）electric hydraulic test pump is the up-to-date series product designed by the Joint Design Group for Hydraulic Test Pump of the General Machinery Research Institute under the Ministry of Machine-Building Industry. It features high level of "Mechanization, Electrification and Automation", long service life, stable performance, flexibility and lightweight that the previous products have, additionally, a drive unit and cross-like converter are added. Therefore, all the performance indicators of this series product have met the requirements; various performances become more stable and reliable with safe and easy operation and power efficiency. In its structure, an enclosed water tank is used, thereby reducing the height of the whole unit and making it more compact and attractive.